Low Brows: Jared and Jerusha Hess let their weird humor reign again in Gentlemen Broncos. There are those who love Napoleon Dynamite, and those who’d rather be serenaded by fingernails on a chalkboard, but give Jared and Jerusha Hess this much: They don’t appear interested in tempering their peculiar sense of humor for anyone. When Napoleon made an indie-film splash five years ago, plenty of detractors found the characters over-the-top caricatures; two years later, Nacho Libre did little to win over those who weren’t already in the Hesses’ corner. Gentlemen Broncos continues the filmmakers’ love affair with quirky oddballs, accentuated this time with more low-brow, gross-out gags. It’s not the kind of movie that will make you feel witty and urbane for laughing—but that doesn’t mean you won’t laugh anyway. Appropriately for the Hesses’ newly rediscovered inner-snickering teen, their protagonist this time around is young Benjamin Purvis (Michael Angarano), a home-schooled, fatherless Utah youth. 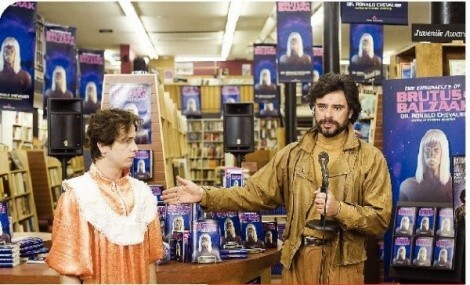 Encouraging his passion for creating pulpy science-fiction stories, Benjamin’s mother (Jennifer Coolidge) sends him to a writers’ camp, where Benjamin meets his idol, fantasy author Dr. Ronald Chevalier (Flight of the Conchords’ Jemaine Clement). But Chevalier is struggling to find a new story his own publisher is willing to accept—which makes it all too tempting for him to appropriate Benjamin’s novella Yeast Lords, which he reads while judging the camp’s writing competition. No one will ever accuse the Hesses of stifling their jokes with too much clockwork plotting, and Broncos finds them creating a very loose framework that allows them to play around in whatever way amuses them at the moment. Angarano’s Benjamin mostly gets to react to the weirdness around him, which includes his “modesty garment”-designing mom, the python-wielding surrogate father-figure (Mike White) recruited by his mother, and the writers’-camp pals (Halley Feiffer and Hector Jiménez) who want to turn Yeast Lords into a movie. Here the humor is predicated mostly on ridiculous clothing, even more ridiculous hairstyles, and just plain grotesque facial expressions—the kind of stuff that has fueled plenty of the filmmakers’ detractors. Subtle, it ain’t. But funny it is—most particularly when Gentlemen Broncos ventures into dramatizations of Yeast Lords. Sam Rockwell turns in a brilliantly un-self-conscious turn as the saga’s hero—Bronco in Benjamin’s version, and a mincing mix of Rip Taylor and Edgar Winter named Brutus in Chevalier’s plagiarized interpretation—occupying a desert landscape of flying taxidermied stags and laser-shooting Cyclopes. Here the Hesses have tremendous fun with the idea of art created within limitations, including both the preposterously low-budget special effects, and the hilariously understated “vulgarities”— perfectly in keeping with author Benjamin’s religious upbringing—spewed out by Bronco when he discovers that the villain has cut his balls off. Throw in a little projectile vomiting—OK, a lot of projectile vomiting—and you’ve got some inspired silliness. More inspired still is the performance by Clement, who turns Chevalier into a giddy portrait of minor-celebrity egoism. Sporting a blow-dried helmet of hair to match his “serious writer” beard, American Indian-ish neckwear and a dramatic baritone cribbed from Michael York, Chevalier revels in his status as a big-shot among nerds, oblivious to the immaturity of his stories’ robot harpies and their “mammary cannons.” Two terrific scenes give Clement a chance to showcase Chevalier’s magnificent pomposity: a seminar at the writers’ camp in which he instructs attendees on the fine art of using suffixes to create fantasy character names; and a Q&A session for a rapt audience of fanboys. It’s the kind of comic acting that could inspire its own cult. Of course, “cult” is probably going to define the appeal of anything the Hesses put their fingers on. Their in-jokes can get extremely in-jokey, predicated on funky things their friends and/or relatives have done, which certainly gives them a distinctive flavor. But their best material in Gentlemen Broncos comes from the stuff that has some sort of backbone: Clement’s gleeful, fully realized work as Chevalier, and the bizarre fictional world that springs from Benjamin’s imagination. When you whittle away the self-indulgent marginalia, you’ve still got something with spirit and a unique vision. If you’re lucky, you’ll be one of those viewers who’s enough of a similarly goofy arrested adolescent to come along for the ride. Visit the Flick Clique page for Scott Renshaw’s podcast interview with Jared and Jerusha Hess.